It looks like Sweden is going to be the first Western nation to officially endorse low-carb/high-fat nutrition and reject the low-fat, low-calorie dogma that has been in place for the last 30-plus years. The change followed the publication of a two-year study conducted by the Swedish Council on Health Technology Assessment. The council reviewed 16,000 studies published through May 31, 2013. Dr. Andreas Eenfeldt (DietDoctor.com) published some of the highlights of this study on his blog here: low-carb-diet effective for weight-loss. 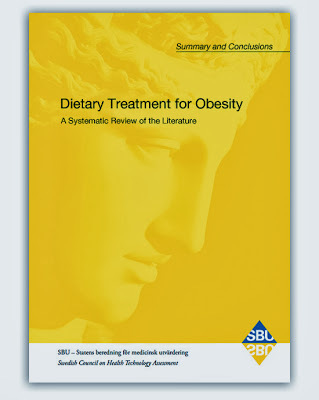 He says he expects future dietary guidelines for the treatment of obesity in Sweden to be based on this report. Dr. Annika Dahlqvist was the catalyst for what has happened in Sweden. I had the chance to meet her and hear her story last May on the low-carb cruise. Dr. Dahlqvist was forced to defend her right to practice medicine after a pair of dietitians accused her of harming her diabetic patients with a high-fat, low-carb diet and reported her to the authorities. The case generated a lot of publicity and the arguments on both sides were widely reported in the media. In January, 2008, the Swedish National Board of Health and Welfare declared publicly that a low-carb diet is “in accordance with science and well-tried experience for reducing obesity and Type 2 diabetes.” She was exonerated and, according to Dr. Eenfeldt, one-fourth of the population of Sweden now follows a low-carb diet. (They call it LCHF, for low-carb, high-fat.) The rate of obesity in Sweden is now 14%, compared to 30% in the US. Australia may be next in line to make the transition. ABC TV in Australia aired a documentary called, “HEART OF THE MATTER: The Cholesterol Myth: Dietary Villains and Cholesterol Drug War.” In it, Dr. Maryanne Demasi investigates the science behind the diet-heart hypotheses and questions the benefits of cholesterol lowering medications. The two-part series features cardiologists, science writers, and other experts who explode the myth that saturated fat and cholesterol cause heart disease. Part 1 caused so much controversy that Australia’s top medicine safety expert, Emily Banks, tried to block the showing of Part 2, using scare tactics and warning that lives could be at stake if it led people to stop taking their statin drugs. A multi-billion dollar industry has grown up around the belief that low-fat, cholesterol-free foods and cholesterol-lowering medications can prevent heart disease. Is any of it based on science? Or is it the biggest mistake in the history of modern medicine? This video contains the answers. “…For the past 60 years, conventional medical authorities have warned that saturated animal fats cause heart disease and should be severely restricted in a heart-healthy diet. As of 2010, recommendations from the US Department of Agriculture1 (USDA) call for reducing your saturated fat intake to a mere 10 percent of your total calories or less. This is astounding, considering the fact that many health experts now believe you likely need anywhere from 50 to 70 percent of healthful fats for optimal health! Unfortunately, I fear our nation will be the last to come to its senses and put an end to the insane notion that traditional food is responsible for modern diseases. Here in Washington, we just witnessed what happens when powerful organizations think their special interests are threatened. GMO labeling, which was supported by two-thirds of the people in the state at the beginning of the campaign, appears to be going down in defeat. It was frustrating that my computer decided to die when it did so I could only watch silently as non-stop ads, full of bogus arguments, urged No votes on Initiative 522. Of the $22 million raised to oppose the measure, only $550 came from state residents. The biggest donors were The Grocery Manufacturers Association, Monsanto, DuPont, and Bayer, who are all heavily invested in genetically engineered crops. Initiative 522 would only have required a few extra words on a label. One can only imagine what lengths the pharmaceutical and food companies would go to in order to protect their multi-billion dollar bonanza generated by the cholesterol myth. Australia, Cholesterol, GMOs, Sweden. Bookmark. Time will tell if he sticks to this, Maureen. I'm sure a lot of his choices and endorsements follow the money. I'm 100% behind a LCHF diet as it has worked wonders for me. But Dr. Oz champions too many conflicting ideas (read: he's a sell-out) and Dr. Mercola is often viewed as a quack (Some of his views are pretty out-there, even though he is at least earnest, in my opinion). So I completely get you, Maureen. I've stopped even mentioning either one of them because too many people distrust what they have to say. The proof for me came in just trying the diet. It will be my "diet" forever now. JinniferO ~ That's the best argument there is – we don't have to wait for some major study or for some organization's endorsement. You have a body. Try it and see for yourself what happens. Gosee Professor Tim Noakes (South Africa's leading Sports Medicine authority, and expert dietician.) he was formerly a High-carb proponent, but has had a complete change of heart (sorry), and now fully endorses the LCHF diet. He says stop eating bread. Have bacon and eggs for breakfast. But then also know that after such a high-protein breakfast you will need a very light lunch.Go for quality protein, not quantity. My father ate almost no fat. He cut the fat off all beef, pork and even bacon. You can imagine how little meat was left after the fat was taken off the bacon. He ate almost no butter and only egg whites. He had his first heart attack before 50 yrs. and had a triple bypass by 53. I only use butter, coconut oil, avocado oil etc. Also eat lots of eggs – yolks too. All good and necessary fats. No heart disease or high cholesterol for me yet and I'm over 60. Anonymous, thanks for sharing your story about your dad. It is so sad how much damage the Low-fat dogma has done. Bruce, thanks for mentioning Tim Noakes. I remember reading about him and may even have posted about his story at some point. It is so refreshing to find a person who can actually admit they have been wrong and make a turn-around. We all need to continue to learn and grow and not be afraid of contradicting ourselves.